Use the tabs on the left for infomation,conservation tips and more! 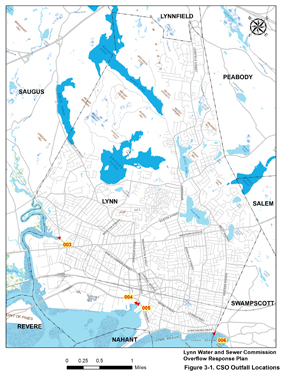 The Lynn Water & Sewer Commission is pleased to post the Annual Reports on the quality of Lynn’s drinking water. The most current contains results of your drinking water tested during 2017 and other important information about your drinking water. The Commission has an extensive water testing and monitoring program which is explained in this report. Test results show that Lynn’s drinking water is in full compliance with all the standards established by the Federal and State agencies that regulate public water supplies. The Commission is pleased to report that it has received the Massachusetts Department of Environmental Protection Drinking Water Award for Outstanding Performance for 2017. The Commission has great confidence in the water that is delivered to the residents of Lynn. Please take the time to read this important report and contact us if you have any questions or comments about the report or your water quality. January 2018 Preventing A Frozen Pipe Emergency! Visit our Community Info page for details! December 2016 Scam Alert: LWSC has received reports of an individual approaching homeowners claiming to sell a water system device and/or insurance, and requesting to enter the home. This individual has no affiliation with LWSC and Lynn Police have been notified. If you have any questions or concerns about your water, please contact LWSC directly at (781) 596-2400. A cross-connection is defined as any actual connection or arrangement between any pipe conveying potable water from a public water system and any non-potable water supply, piping arrangement or equipment including, but not limited to waste pipe, sewer, drain, or other unapproved sources, or any direct or indirect connection between a plumbing fixture or device whereby contaminated water or fluids, gasses or substances may enter and flow back into the potable water piping system or the distribution system of a public water system. This guide discusses the importance of controlling cross-connections and preventing backflow occurrences from unprotected cross-connections in the water system. Backflow - The flow of water or other liquids, mixtures, or substances into the distributing pipes of a potable water supply from any source or sources other than its intended source. Back-siphonage is one type of backflow. Back pressure - Backflow that occurs when the pressure in an unprotected downstream piping system exceeds the pressure in the supply piping. Back-siphonage - Resulting from negative pressures in the distributing pipes of a potable water supply. 2. Where Can Cross-Connections Occur? Lawn chemicals back flowing (back-siphoning) through a garden hose into indoor plumbing and potentially into the distribution system. Back-siphonage of "blue water" from a toilet into a building's water supply. Back-siphonage of stagnant water in fire suppression systems into the distribution system. Back-siphonage of chemicals from industrial buildings into distribution system mains. Backflow of boiler corrosion control chemicals into an office building's water supply. Why is it Important to Have a Cross-Connection Control and Backflow Prevention Program? 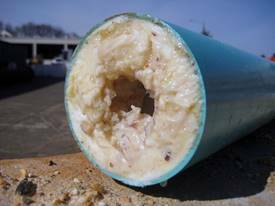 Cross-connections are ever-present dangers that exist in most water systems and can result in serious chemical or microbiological contamination events in drinking water systems. Cross-connections should be protected in order to prevent backflow, which can be hard to detect. In any distribution system, potential cross-connections and therefore sources of contamination can be numerous, varied, and unpredictable. Having these programs in place can help you avoid the costs of responding to a contamination incident. The Commission is responsible for inspecting all industrial, commercial, and institutional premises served and to determine whether cross connections exist and whether all cross connections are either properly protected by an appropriate control device or eliminated. On new installations, the Commission will provide on-site evaluation and/or inspection of plans in order to determine the type of backflow preventer, if any, that will be required. This plan review takes place with the submission of a Design Data Sheet (under the Forms and Documents tab). Installation of the device shall not be performed until an approval letter has been issued by the Commission. Combined sewer systems are sewers that are designed to collect rainwater runoff, domestic sewage, and industrial wastewater in the same pipe. Combined sewer systems are quite common in older cities such as Lynn. 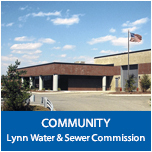 Most of the time, Lynn’s combined sewer systems transport all of their wastewater to the Lynn Wastewater Treatment Plant, where it is treated and then discharged to Broad Sound. During periods of heavy rainfall or snowmelt, however, the wastewater volume in the combined sewer system can exceed the capacity of the sewer system or treatment plant. For this reason, combined sewer systems are designed to overflow occasionally and discharge excess wastewater directly to nearby streams, rivers, or other water bodies. Without overflow structures, this mix would back up into homes, businesses, and public streets. These overflows, called combined sewer overflows (CSOs), contain not only stormwater but also untreated human and industrial waste, toxic materials, and debris. Flows from CSO’s can compromise a water body's uses and lead to water quality violations in the receiving waters. The Summer Street Overflow (CSO 003) is located at the intersection of Summer Street and the Strawberry Brook Culvert, adjacent to the GE Field. This overflow relieves the Western Interceptor and discharges to the Saugus River via the Little River. The Market Street Overflow (CSO 004) is located in Market Street between Munroe and Broad Streets and relieves the Washington Street Submain and the Eastern Interceptor into Lynn Harbor adjacent to Heritage State Park. The Broad Street Overflow (CSO 005) is located in Broad Street between Market and Union Streets and relieves the Union Street Submain and the Eastern Interceptor into Lynn Harbor adjacent to Heritage State Park. The Sanderson Avenue Overflow (CSO 006) is located in Sanderson Avenue at Burrill Avenue and relieves the Eastern Interceptor. The Groveland Street Overflow (CSO 006A) is located in Groveland Street and relieves the Eastern Avenue Submain. Both of these structures discharge to the Stacey Brook Stormwater Conduit, ultimately discharging to King’s Beach at the Lynn/Swampscott boundary. What is FOG? FOG, which stands for Fats, Oils, and Grease, is one of the primary causes of sewer backups into basements. This is the result of pouring cooking fats down the drain or flushing them down the toilet. FOG coats the pipes and hardens, forming a solid blockage in the pipe. What can FOG do to my sewer service? Pouring fats, oils, and grease down the sink or toilet, will lead to a blockage in the pipe. Remember, as a homeowner, you are responsible for the service out to the main in the street. The FOG will quickly coat your pipes and harden, creating a solid mass in the pipe and blocking the wastewater from your home from getting to the sewer main. If you pour FOG down the sink or toilet, it isn’t a matter of IF a backup happens- it’s a matter of WHEN. The good news- it’s preventable! Where can it be safely disposed? FOG materials should be poured into a vessel where it can cool, harden, and then be thrown into the garbage. Metal coffee cans are a great container to pour the grease into, and their size allows you to use it multiple times. Pouring the grease into the can and then wiping the rest away with a paper towel not only prevents grease from getting to the drain, it helps can make cleaning the dishes easier! Once the can is filled with hardened grease, you can throw it in the trash and start again. Restaurants should have a grease trap installed and signs reminding their employees of the proper disposal method. The City of Lynn Health Department inspects grease traps in restaurants. A new issue in the sewer are wipes- baby wipes, cleaning wipes, or any other wipe product that labels itself as “disposable” or “flushable”. Although they are labeled “disposable” or “flushable”, they really do not dissolve when they are flushed. They will continue to accumulate, causing clogging and then more serious blockages. Here is a great article and video showing how wipes really don’t dissolve! Cold winter temperatures can cause water pipes to suddenly burst. This can lead to more serious problems such as service disruption, damage to surrounding pipes and fixtures, and may require the help of a professional. Allow a slow trickle of water to flow through faucets, especially where connecting pipes run through unheated spaces or if the fixture is infrequently used. Standing water is more susceptible to freeze than moving water. Open cabinet doors under the sink in your kitchen, bathroom, etc. This allows warmer air to circulate around the pipes. Protect pipes from exposure to freezing temperatures. Seal/ close any open windows, air vents, and wind drafts near water pipes. Pipes located near cellar windows, along outside walls or in closets, or under staircases are common locations where cold air can collect. Insulate pipes in unheated spaces like garages, basements, and crawl spaces. Avoid major temperature fluctuations- keep the heat on so the temperature does not drop below 55°F. Locate the pipe, keep the faucet open, and apply slow heat to the section of pipe using a hair drier, heating pad, or towel soaked in hot water. Thawing will not be fast, but it will be safe. NEVER USE BLOWTORCHES, KEROSENE & PROPANE HEATERS, CHARCOAL STOVES OR ANY OTHER OPEN FLAME TO THAW PIPES! Fires are caused by people attempting to thaw pipes using open flame devices. Additionally, the rapid heating can actually cause the pipe to burst. *It really can happen! Recently, a large house fire in Nahant occurred as a result of workers attempting to thaw out frozen pipes. Read the details here in the Lynn Item article. If you need assistance in thawing frozen pipes, contact a licensed plumber. If there is no water coming through any of your taps, there may be a problem in your street or yard. If this is the case, call LWSC’s Emergency at (781) 596-2406. Snow melt and inevitable rain in the winter months can create excess water in the roadways. 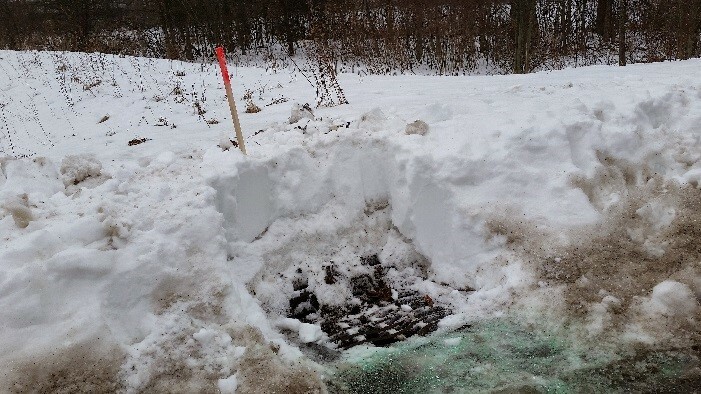 In an effort to prevent this, LWSC crews continuously monitor and clear snow and ice off catch basins in low-lying areas, at the bottoms of hills, and other areas prone to ponding. You can help in this effort by clearing snow and ice off catch basins in your neighborhood so the water has a place to go. An SSO or Sanitary Sewer Overflow, is the accidental discharge of wastewater to the environment prior to treatment. SSO’s occur when areas of the sewer system have exceeded capacity, and are typically the result of extreme rainfall, obstructions in the sewer lines, or a sewer main break. While SSO’s are infrequent, they can discharge to surface waters, streets, parklands, buildings, or other property when they do occur. LWSC has completely separated the sewer and drain systems in approximately 63% of the city, with the remainder to be undertaken and completed in the next 10-15 years. It is important to avoid contact with untreated sewage to avoid the potential of exposure to disease-causing organisms, pathogens, and other pollutants. It is recommended avoiding contact with receiving waters for up to 48 hours after an SSO discharge. If you recognize a possible SSO has occurred or is actively occurring, contact LWSC Emergency immediately at (781) 596-2406. After the cause of the SSO is resolved, it is imperative the area is restored to a dry state. The longer the sewage sits in the home the greater potential for damage and health risk. Removing excess water by pumping, using dehumidifiers, and ensuring adequate ventilation will help reduce this potential. Remember to always pump sewage to a sewer lateral or a vacuum truck, not outside or into catch basins. Salvage any valuable property but make sure to avoid direct contact with sewage, especially around eyes and face or if you have open cuts or sores. Protect yourself by wearing rubber gloves, boots, eyewear, etc. Clean and disinfect anything everything that was touched or may have been touched by sewage with a solution of bleach and water (1/4 cup of bleach to 1 gallon of water). Dispose of all contaminated materials, including upholstered furniture and mattresses. Clothing or supplies worn during cleanup should be carefully disinfected or discarded. You may also decide to hire a professional cleaning company. If you do, make sure to check references and verify the company is insured. Throughout the process, records should be kept of the property damage including any receipts from hired work. Additional information can be found on the Mass DEP Website ‘Flooding and Sewage backups Homecare Guide. Dispatcher records the location, nature of the complaint and immediately dispatches a crew to investigate the complaint. Upon arrival the crew assesses the situation and makes a determination if it is a drain or sewer problem and notifies the homeowner. Check the flow in downstream manhole from the complaint location. If the crew determines it is a homeowner problem they will notify the homeowner that the problem is in their service lateral and inform them to contact a plumber or sewer service contractor to relieve the blockage. If the blockage is in the city sanitary system the blockage will be relieved. If wastewater is in the street the LWSC crew will clean the area and notify the DPW to do street sweeping. If ponding should occur on the street notify the DPW to cordon off the area and to remove debris from the affected area. If the wastewater should jeopardize a playground or park cordon off the entire area. Notification will be given to the Lynn Health Department and Department of Public Works of the incident. The crew will record the water damage to all items in the affected area and record all actions taken of the event from start to finish. Installation of a backwater valve will likely be recommended. More information can be found in our LWSC’s Backwater Prevention Program document. Lynn has a precious resource which is virtually unique in the region: its own water supply and its own treatment and distribution system, independent of any other community or regional authority. After a decade of effort, the quality of Lynn’s drinking water is now unsurpassed and the system provides a volume sufficient for all its residents and businesses. However, like other natural resources, the water supply is not endless. The Lynn Water and Sewer Commission is committed to ensuring this vital resource in every way possible by protecting Lynn’s watershed lands, reservoirs and water distribution system and by encouraging conservation The Commission makes extensive efforts to save water from being wasted through leak detection and root invasion control programs for its hundreds of miles of pipeline. And many Lynn businesses and industries have their own water conservation programs which help the LWSC water supply. The Commission helps residential customers by providing information on how to detect leaks and other ways to save water. Working together, we can continue to make a difference in protecting and improving our fresh water and ocean water environments. We often think of water conservation in terms of summertime outdoor use, but the fact is most water is used inside the house, year-round. In the winter, nearly 100 percent is used indoors, but in the summer it’s still 70 percent of the total, so it pays to concentrate on indoor water conservation. Indoors, 75 percent of all water use is in the bathroom. That’s where your conservation habits can result in the greatest saving of water, and water bills. - Take shorter showers. A shower wastes five to ten gallons of water for every unneeded minute, plus the energy to heat the hot water. - When brushing your teeth, just wet the brush, fill a glass to rinse with, and turn off the water. There’s no need to keep water pouring down the drain. - Rinse your razor. Fill the bottom of the sink with a few inches of warm water. It will rinse the blade just as well as running water, and far less wastefully. - Pamper yourself with a bath. A partially filled tub uses less water than all but the shortest showers. Most families consume 75% of their water using bathroom facilities, including 38% just flushing the toilet. Because older toilets use so much water, it’s likely that you can reduce your total water and sewer bill by 25 percent by installing a new low-flow toilet. If your bathroom was built or remodeled before 1980, the odds are that the toilet uses between 5 and 7 gallons of water every time it is flushed. Some toilets installed after 1980 reduced the water per flush to about 3.5 gallons. But the new state-mandated toilets, which do a good job, use only 1.6 gallons of water for each flushing. That cuts the water use of an average family of four with an older toilet by more than 20,000 gallons per year. Since the average family uses about 80,000 gallons of water a year, if you have a pre-1980 toilet, replace it with a new 1.6 gallon flush unit will cut your total water and sewer bill by about one quarter year after year. Not a bad investment! Household water use averages 38% flushing the toilet, 22% taking showers, 15% using the tub and bathroom sink, 15% doing the laundry and 10% in the kitchen. Concentrate your water conservation in the bathroom: install an ultra low-flow toilet, convert to a low-flow shower head, limit your shower to five minutes and don’t leave the water running while shaving or brushing your teeth. It’s money in the bank.